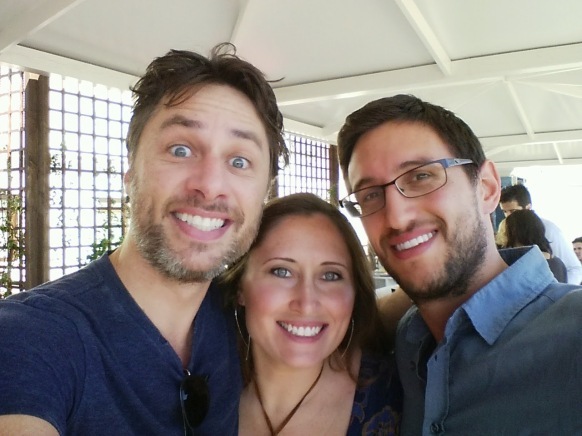 This weekend was the Italian premiere of Zach Braff’s new movie “Wish I Was Here”. It has already been out for a while in the US. It’s received mixed reviews, but I really enjoyed it. I cried through most of it actually. Just like Zach described it, it’s a continuation in tone and feel from “Garden State” but not a sequel in story. For example he’s married to Kate Hudson in this movie, not Natalie Portman. Where “Garden State” was a story about a guy in his 20’s struggling to be an actor, “Wish I Was Here” is about a guy struggling to be an actor in his 30’s. It takes place in LA now and he has very different issues he deals with, like paying for his kids private school, his wife getting tired of supporting him, and generally accepting grown up responsibilities. Where in the last movie it was more finding himself and the juxtaposition of his NJ and LA lives. The film is best known for the fact that Zach raised a good potion of the funding to make it via a Kickstarter campaign. Since he was the first to do this on such a large scale, it became a bit controversial. The naysayers I guess thinking that it wasn’t right for Zach to use his fame to raise money for his own project. I was a backer and I certainly don’t feel tricked in any way; if anything I feel that they over delivered on their promises. 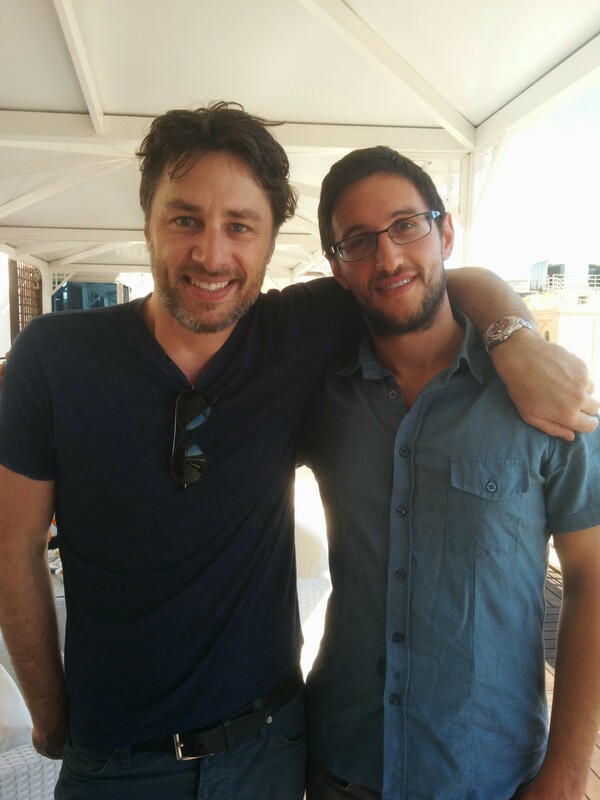 I first showed Daniele the movie “Garden State” a few months before Zach launched the Kickstarter campaign. He really liked it and he also had his 30th birthday coming up (in July 2013, about a month after our wedding in June 2013). So I bought a “for two” benefit and told him about it on his birthday. We then spent the past year getting regular updates on the film’s progression. These were normally in the form of short (well produced) videos on a specific topic, like shooting a tough scene, meeting key member of the crew and what their job was like, touring a facility that was providing his space suit or some fancy camera, casting selections, going to film festivals, and so many more. And then just recently we were mailed two t-shirts (one designed by Zach another designed by a talented fellow backer) and two sets of prints (one of concept art one of movie stills). 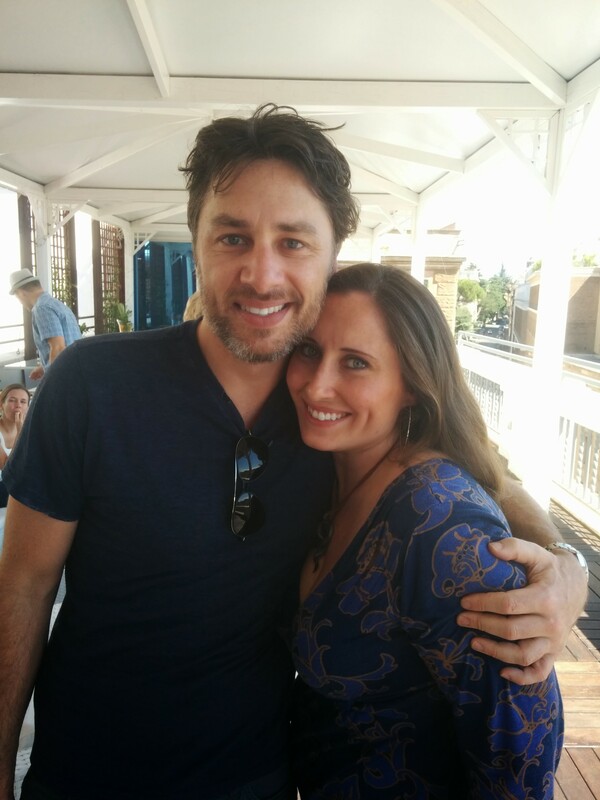 The hallmark of our backer level benefits was meeting Zach for drinks before the Italy premiere. 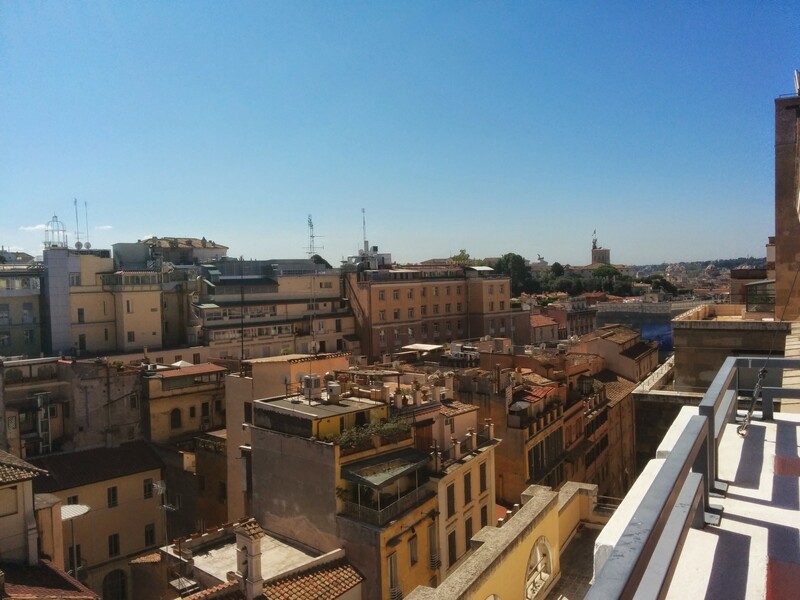 We had a few hours here at this great roof-top terrace, enjoying an open bar and appetizers, while hanging out with Zach, his publicist, and about 12 other backers. He was clearly really tired, he flew in from Vienna that morning and to Berlin that same night. But was still high energy and great to all of us. We chatted, he signed things, took lots of pictures. Then we walked over to the nearby Cinema Barberini. 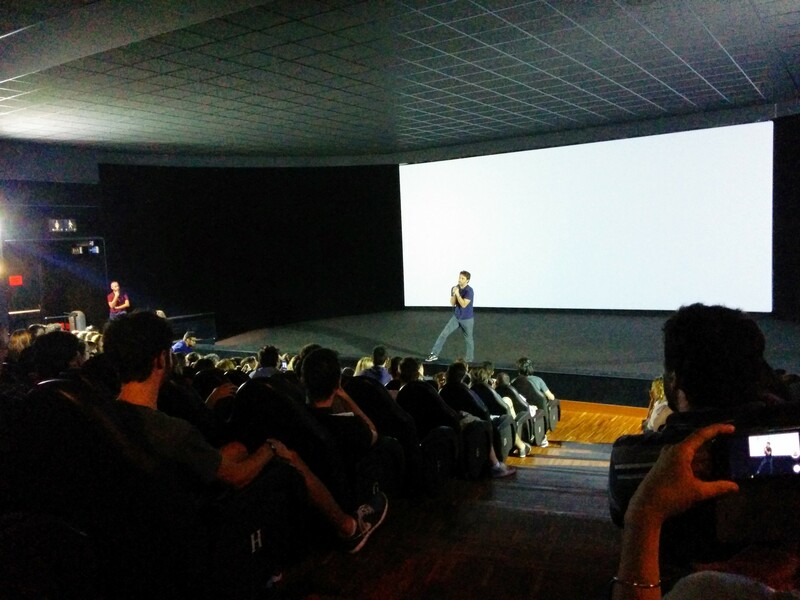 At Cinema Barberini there was a much bigger crowd waiting for us. 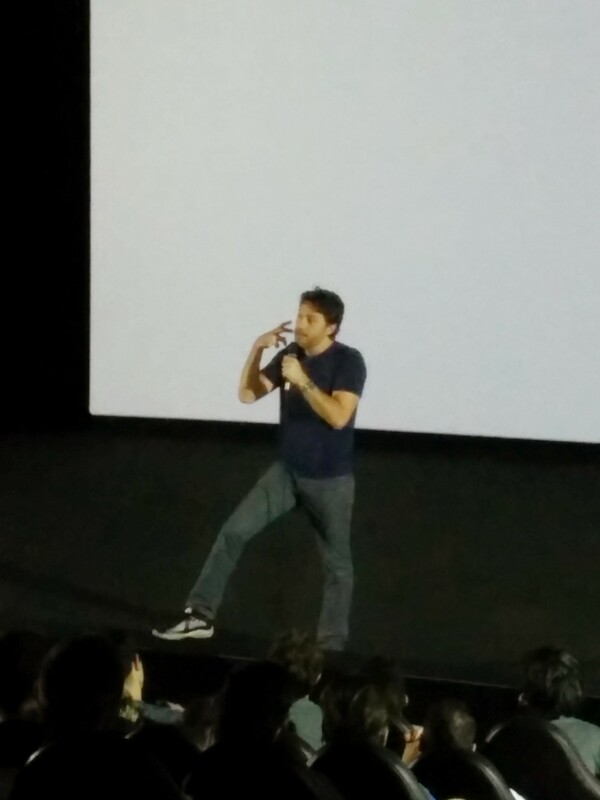 He introduced the film. Then we all watched it (and it was great, like I said at the start), while he tried to see some Rome sites — unfortunately the two closest The Spanish Steps and the Trevi Fountain are both covered in scaffolding right now. It was really cool to see the day dream scenes. We had been sent a video of them filming that scene months before. Or the the scenes from the stills that I have prints of. Or seeing Ashley Greene dressed as a furry, still funny even though I knew it was coming. 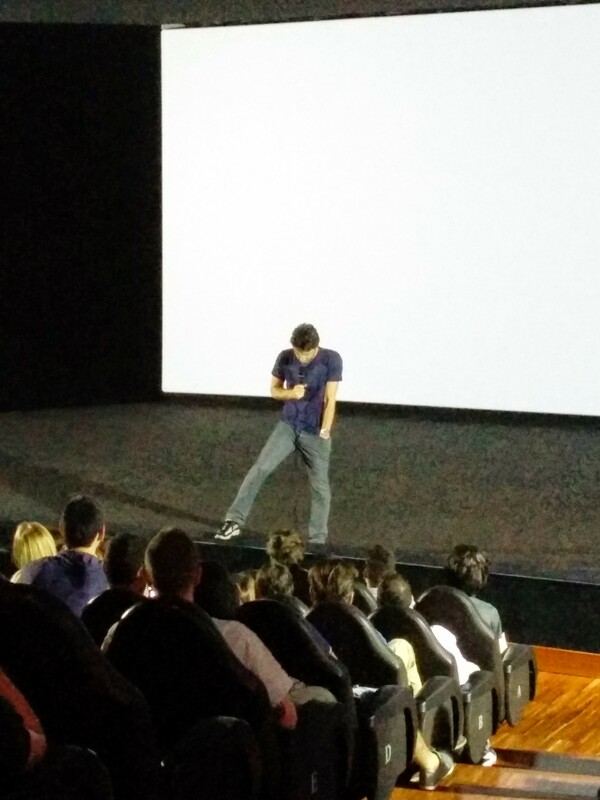 After the movie was over we had a Q&A. The questions were about everything from the story of making this movie, Scrubs, past movies of his that I had never even heard of but were big in Italy, and or course the Italy distribution issue. Unfortunately, this will probably be the only projected screening of the film, because Italy was the only European country where they were not able to get a distribution partner. Not having a distribution partner also meant there was no one to add subtitles to the film, so I think a few Italians were not able to understand it very well. He said they may try again for dvd release. I’m disappointed in Italy on this. Zach also said that he probably would not do a kickstarted movie again. While it was the only way this movie would have been made, because traditional movie funding would have demanded too many changes. Managing thousands — 46,520 to be exact — kickstarter backers was pretty demanding in itself. Not to mention that the kickstarter thing dominated how everyone talked about the film and besides organizing all of our rewards and demands, he had to spend a lot of time kind of pr-managing how people were talking about the kickstarter aspect, defending himself when others said he was somehow scamming all 46,520 of us. Oh yeah, and writing, directing, producing, and starting in the movie. Turned out all that was pretty time consuming. Overall, it was an amazing day over a year in the making. I can’t thank enough Zach and all the other people who made the movie and the kickstarter possible! I simply want to mention I’m newbie to weblog and truly enjoyed your page. Probably I’m going to bookmark your blog post . You actually come with remarkable articles and reviews. Cheers for revealing your website page. I simply have to notify you in which I’m just novice to posting and clearly liked your information. More than likely I am likely to store your web post . You seriously have memorable article topic. Appreciate it for expressing with us your internet webpage. I merely intend to show you that I am new to wordpress blogging and very much adored your article. Quite possibly I am most likely to store your article post . You definitely have superb article reports. Truly Appreciate it for share-out with us your site webpage. Hi! I simply would like to offer you a huge thumbs up for the excellent info you have right here on this post. I will be returning to your web site for more soon. We just wish to share it with you the fact that I am certain novice to blogging and totally adored your work. Very likely I am likely to bookmark your post post . You simply have magnificent article text. Love it for sharing with us your web information. I just have to show you which I’m just raw to writing a blog and genuinely admired your work. Probably I am going to store your post post . You seriously have great article subject. Appreciate it for telling with us your url post. Magnificent goods from you, man. I’ve understand your stuff previous to and you’re just extremely magnificent. I really like what you’ve acquired here, certainly like what you are saying and the way in which you say it. You make it enjoyable and you still take care of to keep it sensible. I can’t wait to read much more from you. This is actually a tremendous website. We just need to notify you the fact that I am certain novice to blog posting and genuinely admired your work. Likely I am going to store your article post . You undoubtedly have outstanding article reports. Truly Appreciate it for sharing with us your internet site article. Great post. I was checking constantly this blog and I am impressed! Extremely useful information specifically the last part :) I care for such info a lot. I was looking for this certain info for a very long time. Thank you and best of luck.